SOLD OUT - these were a huge hit this year and even the manufacturer has sold out. These beautiful baubles will be back in stock for next Christmas. 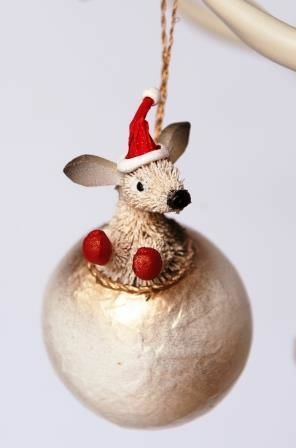 Adorn your Christmas tree at work or home with this stunning Kangaroo Christmas tree bauble. Made from Buri Palm Fibre, this beautifully designed piece will look gorgeous hanging from your tree this Christmas. Baubles also available with a kookaburra, koala and platypus or buy in a boxed set of all 4! Lightweight and makes a great gift for friends and family overseas.